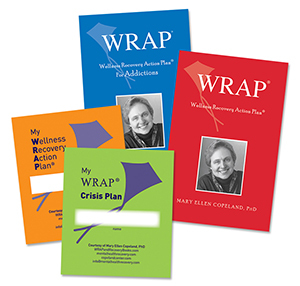 The WRAP-Up Essentials Special Includes: 25 Wellness Recovery Action Plans, 25 WRAP for Addictions, 25 My WRAPs and 25 My WRAP Crisis pamphlets. This convenient bundle of the core WRAP Products is available for ONLY $450.00 – A Savings of $87.50. Buy the bundle and save! NEWLY UPDATED –The cornerstone of WRAP – This book has broad applicability and is used world-wide as a basis for recovery. It is a popular personal guide for developing a Wellness Recovery Action Plan (WRAP). Agencies can purchase this book for distribution to people working with a care provider in WRAP groups or for individuals who are working to develop their own WRAP. NEWLY UPDATED – WRAP for Addictions is an adaptation of the popular personal guide to developing a Wellness Recovery Action Plan. Adults and older teens who are working on recovery from addiction issues benefit from having their own copy. Agencies can purchase these books for distribution to people in WRAP groups, people who are working with a care provider on developing their WRAP, or people who are working on their own to develop a WRAP.